The evening primrose is a flower that grows throughout North America and parts of Europe. Oils derived from this plant are used in traditional folk remedies throughout the world. They are now offered in supplement form. Sometimes called primrose oil supplements, these products are used for many different purposes. 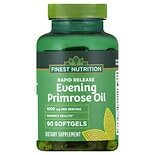 Medical science continues to research the benefits of evening primrose oil. 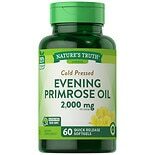 The Natural Medicines Comprehensive Database states that evening primrose oil is "possibly effective" at helping to reduce breast pain in women who are suffering from symptoms due to deficiencies of certain nutrients called essential fatty acids. In addition, the herb is identified as "possibly effective" for lowering the risk of osteoporosis (a disease that causes tiny holes to form in the bones) when taken with calcium and fish oil supplements. Yet, more evidence is still needed to support the use of evening primrose oil for these conditions. 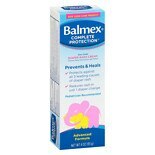 Walgreens offers a wide variety of evening primrose oil supplements to suit your needs. Whether you need a product with a low dose of evening primrose oil or a high dosage, you'll find different options to choose from to get the benefits of evening primrose oil as easily as possible. 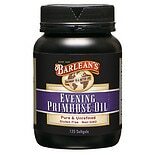 While evening primrose oil is generally considered safe, the safety of taking it for long periods of time has not been established. Mild side effects can occur while using the oil. These may include stomach upset and headaches. 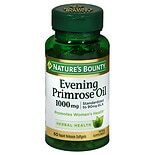 Evening primrose oil can make the blood thinner and may increase the chance of bruising and bleeding especially if you have a blood clotting problem or take other medications or herbal supplements that thin the blood. Avoid or stop using evening primrose oil at least two weeks before a scheduled surgery. If you have epilepsy or another type of disorder that causes seizures, taking evening primrose oil can put you at an increased risk for having seizures. People who suffer from schizophrenia and are being treated with phenothiazine medications should not take evening primrose oil. There is a risk that evening primrose oil could result in dangerously low blood pressure when used with certain blood pressure medications. Some studies have also indicated possible interactions between evening primrose oil and a type of antidepressant drug known as selective serotonin uptake inhibitors. These include citalopram, escitalopram, fluoxetine, paroxetine and sertraline. 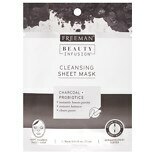 Consult your physician before using any evening primrose product.